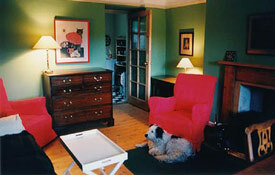 Littleton of Airlie Farm Cottages provide a choice of 2 traditional holiday cottages close to the Angus glens. Each cottage sleeps 2 + 1 baby. Accepts dogs at additional charge. 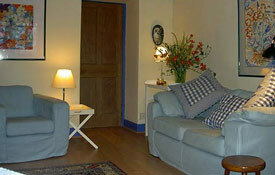 Littleton of Airlie Farm Cottages provide comfortable holiday accommodation for up to 2 guests + 1 baby per cottage. 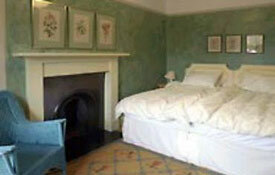 There is a choice of 2 cottages both of which look out over the beautiful walled garden. Located near Kirriemuir, Alyth and Blairgowrie (Scotland) this pet friendly accommodation accepts dogs at a additional cost of £20 per booking. Littleton of Airlie Farm Cottages are located within the ancient vale of Strathmore, which divides the Grampian Mountains from the Sidlaw Hills. There are 2 properties to choose from which form part of a little terrace of traditional red sandstone cottages. Benefiting from a wonderful walled garden (which guests are free to enjoy), the charming cottages are in a rural, yet prime, location for exploring much of Scotland. 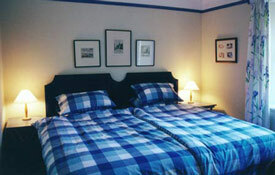 These 3-star VisitScotland graded cottages are comfortable and well equipped. Each cottage comprises lounge with fire, well equipped kitchen, bathroom with shower over bath and bedroom with hotel style zip link beds which can be set up as kingsize or twin configuration. In addtion, Cottage #1 has a lovely roll top bath and cottage #2 has a separate dining room. The surrounding area has much to offer including hill walking, fishing, golf, castles, art galleries, antiques, busy harbours, tall ships and mystical pictish stones most of which can be found within 30 minutes drive of the accommodation in nearby Perth, Dundee and Pitlochry. Edinburgh, Balmoral and the Trossachs are also easily accessible for a day trip. The owner is normally on hand to welcome you and offer advice on the local area and activities ensuring an enjoyable stay is had by all. A real cosy retreat! Dogs welcome for which an additional charge of £20 will be applied.